"...Our commitment is to leadership in learning... to ensure a quality of undergraduate and graduate education that allows Western's graduates to assume leadership positions in public affairs, the scholarly world, the business world, the performing and fine arts, the professions, community organizations, and the many other areas of endeavour to which they aspire." "...Western is one of the best universities in Canada. I’ve learned this through my experience as a student as well as my experience working for different departments on campus." Expand graduate enrolment while maintaining quality: Over the past 10 years, graduate enrolment has grown from 3,324 to 4,777 in 2012-13 (or from 14% to 17.6% of total enrolment). A sustained growth of graduate enrolment is an essential means to strengthening the research and scholarship culture at Western. We will achieve this goal by expanding enrolment in existing masters and doctoral programs, and by creating new graduate programs where the hosting academic unit has determined growth or new programming is appropriate. Among the key considerations in optimizing enrolment in each of our graduate programs will be the size and quality of the applicant pool, the demand for graduates in that particular discipline or profession, the competitiveness of our programs' graduates in finding employment or placement for further study, and, to ensure the quality of the program while supporting the success of our students through the availability of faculty, staff and library resources. Establish new and innovative professional Masters programs: Increasingly, graduate education gives students advantageous pathways to launch careers in a highly competitive and increasingly global job market. Western will develop new and innovative professional Masters programs that meet the evolving demands of students, society, and industry alike. Enable interdisciplinary study: Programs offering students courses outside their degree area enrich the learning experience while contributing to the interdisciplinary culture Western continues to build across campus. Western will achieve this goal by minimizing structural and budgetary barriers at the Faculty and Department levels. Minimizing such potential obstacles will enable undergraduate and graduate students to explore the full range of their interests within the scope of their degree program. Articulate University-level learning outcomes: In accordance with the Degree Level Expectations directives of the Ontario Council on Quality Assurance, Western will articulate undergraduate and graduate learning outcomes at the institutional level, taking into account the University's distinctive mission, culture, and values. Institutional learning outcomes provide a framework for program- and course-level learning outcomes, which will identify the knowledge, competencies, and skills undergraduate and graduate students may expect to achieve. Curricular mapping and assessment techniques designed to demonstrate specific learning outcomes will support program innovation, student learning, and outstanding academic quality. 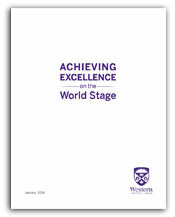 Promote excellence and innovation in teaching and learning: As a founding member of the Society for Teaching and Learning in Higher Education, home to the Society's national journal, and to the Centre for Education Research & Innovation, Western has a long-standing commitment to evidence-based pedagogical practice. Through the contributions of faculty, staff, librarians and archivists, graduate students and postdoctoral scholars engaged in teaching, Western values pedagogical innovation, including facilitating active and deep student learning. The recently announced Teaching Fellows program will enhance pedagogical research, promote effective teaching practices across campus, and recognize excellence, particularly in emerging areas of teaching research such as experiential education and technology-integrated learning. Teach transferable knowledge and leadership skills for the 21st century: Regardless of their program of study, undergraduate and graduate students should graduate with well-developed critical thinking and communication skills requisite to any career. They should also have professional development opportunities embedded in their programs to enable students to explore and acquire the kinds of leadership and entrepreneurial skills increasingly in demand in today's marketplace. Implicit in this expectation is that the University and prospective employers have a shared understanding of how different degrees prepare graduates for success both within and beyond academia. Professional degree programs have long articulated the knowledge and skills their successful graduates acquire, and the same expectation must become a higher priority for undergraduate and graduate programs across the disciplines. Educate and support development of the whole person: Developing tomorrow's successful global leaders involves more than outstanding academics—it requires attention to wellness of mind, body and spirit. A key to Western's success in providing Canada's best student learning experience has been our recognition of the needs of the whole student as expressed in Western's exceptional range of curricular, co-curricular, extra-curricular, and student support programming. From residence and recreational programming, informal socializing and collaboration in libraries, to student government, varsity athletics, and special interest clubs, our students have near limitless possibilities for augmenting their education beyond the classroom. Western also recognizes that different kinds of students may require different kinds of support. To this end, Western will strengthen the full range of student development, academic counselling and administrative support services that contribute to student success across the student body—from domestic to international students, and from first-year and upper-year undergraduates to graduate students and postdoctoral scholars. Western will also work to facilitate collaboration among various service providers with a view to ensuring that all students are directed toward the best service available to meet their specific needs. Promote and support experiential and international learning opportunities: Educating the whole person also entails providing experiential learning opportunities that occur beyond campus in the broader community, across the full spectrum of disciplines—from the arts and humanities and social sciences, to the physical and health sciences, to the professional programs in medical, legal and engineering professions. Today's students seek to round out their degrees by applying their acquired knowledge and skills in hands-on, real-world settings. Students and employers alike expect to do this through such learning activities as: participation in internships, co-op, and job shadowing programs with industry partners; service-learning projects with non-profit community groups; study-abroad and academic exchange programs; and social justice or international development initiatives with non-governmental agencies. In these contexts students learn to apply the knowledge and skills they learn in the classroom to practical “real world” situations. Western will invest the incremental resources required to increase the number of Work Integrated Learning Experiences and international learning opportunities available so that any academically eligible student wishing to participate in such learning experiences will have opportunity to do so. Western will also endeavour to collaborate with various campus and external community partners to optimize coordination efforts. Engage more undergraduate students in the research enterprise: Western recognizes that many undergraduates demonstrate interest and capacity to enrich their learning through direct participation in research. Indeed, it is by focusing on research and undergraduate student involvement in research that Western can take the student learning experience to the next level. Building on our Mission to educate global citizens at a top research-intensive university, Western will provide greater opportunities for undergraduates to engage with research as part of their degree. This may include greater incorporation of inquiry-based learning into the existing curriculum, providing more opportunity for the presentation of student work through undergraduate journals, conferences and Western's institutional repository (Scholarship@Western), as well as more hands-on involvement with research projects conducted in campus laboratories. Innovate our pedagogy through alternative means of undergraduate and graduate program delivery: Currently, many faculty, staff, librarians and archivists, graduate students and postdoctoral scholars use alternative, hybrid, and blended teaching methods in their courses to enhance the student learning experience. Illustrating this point, courses offered entirely online now account for 10% of all instruction, representing some 185 courses for undergraduates in direct-entry programs. In a recently released report, Western's Task Force on E-Learning proposed a digital learning strategy for the University. Western's Network for Digital Education & Research has prepared a response to the report. These two documents will inform Western's approach to building on current alternative, hybrid, and blended teaching practices. We will do so by providing infrastructure and technical support for the introduction of new and innovative modes of pedagogy where demand and opportunities are identified at the local academic unit level. Maximize our Libraries' contribution to supporting student success and scholarly excellence: Western Libraries play a uniquely foundational role in connecting students, faculty, postdoctoral scholars and staff from across the local and global academic community, and has long been a key partner in the creation, dissemination and application of knowledge. Responding effectively to evolving demands placed upon our physical and virtual learning environments by our academic community is key to the future success of our Libraries. To this end, Western is committed to providing access to essential learning resources, to maintaining and creating space for individual and collaborative learning, to embedding information literacy in the curriculum, and to providing high-quality library services and instruction. Embrace the principles and practices of an environmentally sustainable campus: Thanks in part to the President's Advisory Committee on Environment & Sustainability (PACES), Western has reason to be proud of the many environmentally focused processes, programs and facilities implemented across our campus community. Working to increase environmental awareness and reducing our impact on the environment is a labour we share with other globally minded universities. To this end, Western is committed to promoting and supporting innovations in sustainable practice as outlined by the PACES Sustainability Strategic Plan.